EURUSD declined towards 1.15 area which is the lowest level within the last recent months. Today there are no major economic reports in Eurozone but the US will publish the consumer confidence data. 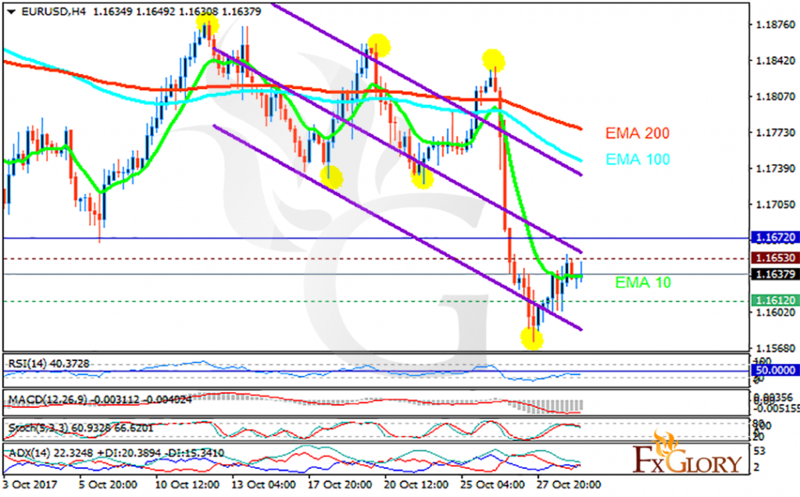 The support rests at 1.16120 with resistance at 1.16530 which both lines are below the weekly pivot point at 1.16720. The EMA of 10 is moving horizontally in the descendant channel and it is below the EMA of 200 and the EMA of 100. The RSI is moving below the 50 level, the Stochastic is moving in high ranges and the MACD indicator is in negative territory. The ADX is not showing any clear signals. The resistance level breakout will smooth the way for further growth towards 1.17 area followed by 1.20 otherwise it will continue its bearish trend towards 1.15.